Continuing from the first five songs we had presented last week, here are the next five in the set of fifteen favorite Christmas songs. The last set shall be posted on December 24. Like last time, click on the song title to watch the song. 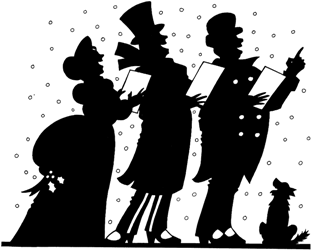 The Christmas Song (Nat King Cole) – Another song that has been covered by multiple artists (the most covered Christmas song according to BMI). The first, and the best, recording of the song happened at the hands of the Nat King Cole Trio in 1946, a recording that in 1974 went on to get inducted into the Grammy Hall Of Fame. A song that wonderfully captures the holiday mood, both lyrically (the warmth with which Nat starts off chestnuts roasting on an open fire is sure to give you the Xmassy feel!) and arrangement-wise, this one is a must-have on every Christmas songs list. Happy Christmas (John Lennon & Yoko Ono) – Though more of a protest song as is obvious from the lyrics, over the years the track has come to be considered as a Christmas song, the arrangement possibly being the major factor. A timeless classic from Mrs. and Mr. Lennon. Santa Claus Is Coming To Town (Bruce Springsteen) – This is beyond doubt the sweetest Christmas carol ever made. And with a Springsteen twist to matters this version of Santa Claus Is Coming.. is a pleasure to listen to. White Is In The Winter Night (Enya) – An ethereal tune, a wonderful string-dominated orchestra, Enya. Deadly combo for a Christmas song. I was confused whether to choose this or the Gaelic version of Silent Night from the same album of Enya titled And Winter Came, this one finally winning the tussle. Better Days (Goo Goo Dolls) – Though the song follows the band’s usual love ballad template, the soaring vocals, the ambient orchestration and the likes, there are some obvious references to Christmas in the lyrics, like “the one poor child who saved this world”. And hence the song qualifies to this list. We shall back on Christmas Eve with the final five. Cheers!